The Moriches Elementary School Student Council and members of the student Peer Mediation group have come together to “cultivate kindness”. Moriches, NY - March 14th, 2016 - The Moriches Elementary School Student Council and members of the student Peer Mediation group have come together to “cultivate kindness” through a school-wide kindness program inspired by the book, “A Little Rees Specht Cultivates Kindness,” the story of a young farmer who discovers that kindness, like a seed, will only grow and spread if one takes the time to cultivate it. 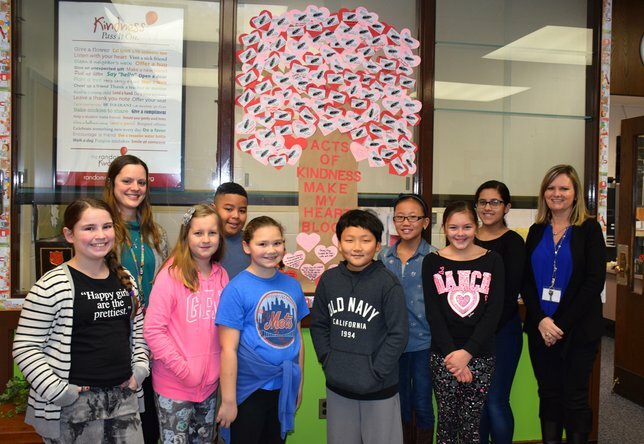 As part of this kindness project, teachers throughout the school received hearts to give out to students who are caught performing random acts of kindness toward someone else and placed upon a “Tree of Kindness” located in the school’s main lobby. The students’ goal was to post 100 hearts upon the tree of kindness by the 100th day of school last month. Great job by the students and their advisors, Danielle Pallace, resource room teacher, and Melissa Knoetgen, school social worker! Subject: LongIsland.com - Your Name sent you Article details of "Moriches Elementary Students Cultivate Kindness in School"